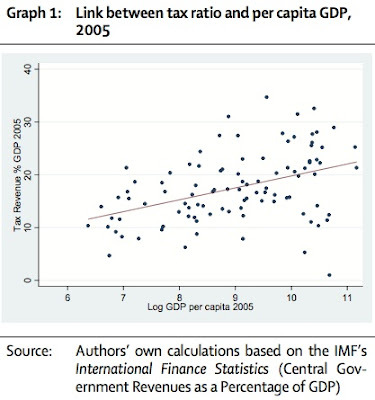 Tax Justice Network: Should we Engage in Development Cooperation with Countries that Have a Notoriously Low Tax Ratio? The headline is drawn from a new paper by the German Development Institute Deutsches Institut für Entwicklungspolitik, and it includes this nice little graph. "This is one of my pet peeves: Countries that will not tax their elites but expect us to come in and help them serve their people are just not going to get the kind of help from us that they have been getting . . . Pakistan cannot have a tax rate of 9 percent of GDP when land owners and all of the other elites do not pay anything or pay so little it's laughable, and then when there's a problem everybody expects the United States and others to come in and help." The question the Germans pose is a good one indeed. Conditionality has had quite a bad press - among other things, it smacks of colonialism and external pressure and imperialism and all that. But what this particular conditionality would do is to seek to make countries less dependent on donors (by developing their autonomous tax-raising systems), not more. It's an interesting twist. "Is it appropriate to stop development cooperation with these countries altogether? Not necessarily, but the nature of cooperation should at least be adjusted in such cases. States that are highly fragile, are engaged in a military conflict or post-conflict situation or have difficulty in collecting taxes for structural reasons should not be uncoupled from development cooperation, but greater emphasis in that cooperation should be placed on strengthening their tax systems. Govern- ments should be supported in their efforts to increase tax revenue (through the linking of financial allocations to improvements in the tax system, for instance). How- ever, in the absence of success and when the partner countries’ decision-makers obviously lack the will, do- nors must ask themselves how cooperation with such governments can be justified in development policy terms and continue to be legitimised at home."